SK hynix has developed the world’s first 4D NAND flash memory using both Charge Trap Flash and Peri Under Cell technologies, with a plan to start mass production this year, according to the chipmaker on Sunday. 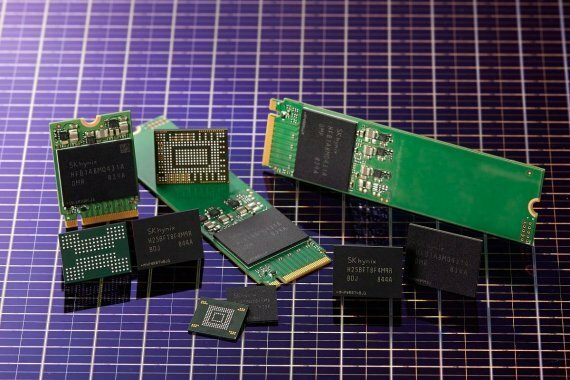 SK hynix said it developed 96-layer 512-gigabit NAND flash, named CTF-based 4D NAND Flash to distinguish it from current 3D NAND flash technologies. The NAND flash memory chip is widely used for the storage of mobile devices and data centers as it preserves data even when power is cut off. A single 512-gigabit NAND flash chip can represent 64 gigabytes of storage. Although its rivals, Samsung Electronics and Toshiba Memory, began mass producing 96-layer NAND flash in July and September, respectively, SK hynix said its latest chip is different from them in that it additionally used Peri Under Cell technology to maximize productivity together with Charge Trap Flash technology. Charge Trap Flash is a technology adopted by most chipmakers to improve performance and productivity by minimizing interruption among cells. Peri Under Cell is a technology that locates peripheral circuits, normally placed by the side, at the bottom of cells to maximize space efficiency. It is similar to an outdoor parking area being relocated to an underground parking lot. Through the new design, the chip size of 96-layer 512-gigabit NAND flash is reduced by more than 30 percent from the current 72-layer 512-gigabit NAND flash. The product has 30 percent higher write and 25 percent higher read performance. Its data bandwidth has also doubled to the industry’s biggest 64 kilobytes, according to the firm. “We plan to start early-stage mass production of it within this year and further expand the production in M15 fab to actively respond to a variety of clients,” said Vice President Kim Jung-tae, head of the firm’s NAND marketing division. SK hynix’s M15 semiconductor fab is in Cheongju, North Chungcheong Province,. SK hynix said it will also introduce 1-terabyte client solid-state drives equipped with its own controllers and firmware within this year and the enterprise solid-state drives will be introduced in the second half of 2019.